Explore Brisbane's surroundings by going to Surfers Paradise (SkyPoint Observation Deck, Infinity Attraction, & more), Warner Bros. Movie World (in Oxenford) and Sea World Theme Park (in Main Beach). Pack the 18th (Thu) with family-friendly diversions at Dreamworld. Spend the 25th (Thu) exploring nature at Conondale National Park. The adventure continues: let little ones run wild at South Bank Parklands, learn about wildlife with up-close encounters at Australia Zoo, look for all kinds of wild species at Lone Pine Koala Sanctuary, and admire the natural beauty at Brisbane Botanic Gardens Mt. Coot-tha. 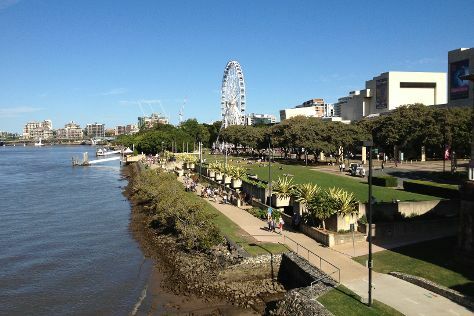 To find where to stay, photos, more things to do, and other tourist information, refer to the Brisbane day trip app . If you are flying in from United Kingdom, the closest major airports are Brisbane International Airport and Gold Coast Airport. In April, daytime highs in Brisbane are 30°C, while nighttime lows are 19°C. Cap off your sightseeing on the 28th (Sun) early enough to travel back home.